So I’d seen Heston make this lemon tart on the telly & he made it look ever so easy! Crisp golden pastry & zesty lemony filling with a dollop of creme fraiche on the side looked like dessert heaven to me. And then as luck would have as a Birthday present his cook book Heston Blumenthal at Home arrived on my doorstep & I couldn’t resist a slice. The tart did go down a treat for a Sunday lunch & as leftovers at work the next day. So the tart is definitely worth the effort. For me, my oven slightly over cooked the edges of the pastry & slightly under did the base if I was being really picky. However, I think that’s because it wasn’t rolled out quite thin enough. A little practice in pastry making called for. The filling is wonderful, smooth & just the right amount of sweet lemon flavour. For the pastry blitz the icing sugar & egg yolks in a tall container with a hand blender. Place the flour, butter & salt in the bowl of a mixer with the paddle attachment & mix on low speed until it looks like cornmeal, 2-3 minutes. Add the vanilla seeds & lemon zest & then add the egg yolk mixture & continue to mix on low speed until all combined & you have a soft dough. About 3-5 minutes. Shape the dough in to a flat rectangle, wrap in cling film & pop in the fridge for 1 hour. After an hour remove from the fridge & roll the pastry out between 2 sheets of baking paper until 2mm thick & then place it in the freezer for half an hour. Line a 26cm tart tin (2.5cm deep) & spray with a little oil & then place in the pastry, letting the edges hang over. Prick the base with a fork & place back in the freezer for another 10 minutes. Remove from the freezer & line the pastry case with scrumpled up baking paper & baking beans. Place in the oven to bake for 30 minutes. After 30 minutes remove the baking paper & baking beans & pop back in the oven for another 10 minutes. Remove from the oven & allow to cool a little. Trim the overhanging pastry by running a sharp knife around the top of the tart tin & discard & leave the tart to cool completely. When ready to bake pre heat the oven to 120C/250F & place the tart in the oven to warm up. Place all the filling ingredients in a bowl & mix together using a spatula. Place the bowl over a saucepan of simmering water & allow to warm up until the temperature reaches 62C/144F. At this point strain the mixture through a fine sieve in to a jug. Remove any bubbles from the surface with a spoon. Slide the oven rack out a little & pour in the filling. Fill the case to the top & carefully slide the rack back in & bake for about 25 minutes until the temperature reaches 70C/158F or until just set, I totally forgot to take the temperature. Allow to cool completely at room temperature. Just before serving sprinkle over some icing sugar & serve with dollops of creme fraiche. With a good dollop of creme fraiche it is a delightful dessert & the perfect end to a long lazy Sunday lunch. 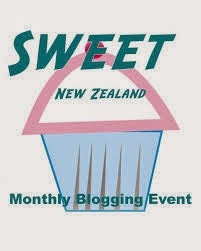 This is also my entry for Sweet New Zealand being hosted by the ever so lovely Sue at Couscous & Consciousness. There’s been a bit about out there about social media & how bad it is & how we spend too much time on it. Oddly enough this has all appeared on social media! And I get it; I am as guilty as the next person, we probably all do spend a little too much time on our phones, on our tablets, reading Facebook, Instagram, Twitter, Snap Chat or whatever the latest app is. But....well I love it. Not to mention it lets me keep in touch with friends & family on the other side of the world at the touch of a button. It’s wonderful that my niece can pick up her iPod, hit a button & we’re there seeing each other & chatting away. I’ve met many amazing people through social media online & then in person. And that is where the social part comes in, well for me anyway. You take it off line & in to reality & social media can become, well quite social. And this is what happened the other week. Emma from My Darling Lemon Thyme was over in New Zealand for the launch of her cook book & we managed to squeeze in a little lunch & finally got to meet in person after 3 or so years of chatting, tweeting & following each other on line. In fact 4 of us food bloggers, all who had originally met on line met for lunch at Little Bird Unbakery on Summer St. And very social it was too. So you see it’s not all bad, in fact it is all very good if you actually put the social part in to practice. If you haven't checked out Emma’s blog you should, it’s over here & buy her book; My Darling Lemon Thyme - Recipes from My Real Food Kitchen*. It’s all vegetarian & gluten but most importantly full of the wonderfully delicious recipes. There’s small plates with the likes of sweetcorn & basil fritters or snow pea & avocado noodle salad with soy ginger dressing or terribly tempting corn, coriander & feta muffins. And I’ll be making the carrot, cumin & red lentil soup with coriander cashew pesto this afternoon. *Buy it here at Cook The Books. There are wonderful sweet treats; a peach, rosemary & yoghurt cake or how about some raspberry, dark chocolate & pistachio brownies? Or dark chocolate, orange & rosemary truffles!! For the main event there’s a roasted cherry tomato quiche with chickpea crust or even pizza topped with chilli, greens & bocconcini & an olive salsa. There’s also a whole lot of bright, vibrant smoothies & juices. And the first thing I cooked, well it was these kumara & kale latkes with poached eggs for Sunday breakfast. I have a thing for anything crispy & golden. These can be whipped up pretty, once the kumara has sat for 10 minutes it’s mix everything up, fry, poach & eat. *the only addition, a little fresh red chilli as I do love my chilli. Plus it’s such a good friend to the sweet kumara & the robust curly kale. Next time I think I might add a little coriander too. Pre heat oven to 120C/250F. Place the kumara & salt in a bowl, mix well & set aside for 10 minutes. Pick up handful’s of the kumara & squeeze & squeeze to remove all the excess liquid & place in a clean bowl. We don’t want soggy latkes. Add the kale, spring onion, red chilli, eggs & parsley & season with salt & pepper. Heat a couple of tablespoons of olive oil or ghee in a frying pan over a medium heat. Grab a little, about a quarter cup of the latke mixture & give it a little squeeze before placing it in the frying pan & flattening it with a spatula. We don’t need perfect circles just golden crispy fritters. Cook for 2-3 3 minutes until golden & brown underneath & flip them over & cook for a couple of minutes more. Place on a kitchen paper lined plate & pop in the oven to keep warm. Repeat with the remaining mixture until all used up, you’ll get about 12 latkes. Fill a medium saucepan with some water, I fill about half way. Add the cider vinegar & bring to a boil. Reduce the heat to a simmer, give it a good swirl & crack the eggs in the swirl, 2-4 at a time. Simmer for 3-4 minutes until cooked as you like them, for me it’s got to be an ooey gooey golden centre so 3 minutes is perfect. Lift the eggs gently out with a slotted spoon & drain on some kitchen paper. To serve, place 3 latkes on a plate & top with one or two poached eggs. Season will a little salt & pepper & a little more chilli if you like. Crispy, sweet & packed full of that green kale goodness you will feel immensely satisfied & virtuous all at the same time! The perfect combination for me at present as we want a few weeks of healthy living before hitting the UK, The Netherlands & Singapore for a 4 weeks trip with will no doubt be brimming over with all sorts of deliciousness!